The Xvari air-over-hydraulic pumps from Enerpac (A Division of Actuant Corp) deliver safety and control in container repair jobs. Shipping containers often suffer dents and structural damage that need to be repaired to maintain their structural integrity, appearance and value. Given the rising cost of new as well as used containers, it makes good economic sense to keep container stocks in good repair. An Australian container company recently approached Enerpac for a solution to safely and precisely remove damage from its containers. Enerpac Australia Sales Manager Darryl Lange explains that shipping containers have to stand up to extended periods on a heaving deck under all weather conditions, then be subjected to extensive crane handling and movement by trucks and trains. He specified an Xvari air/hydraulic pump driving an Enerpac 10-tonne cylinder to actuate custom fabricated extending rods developed by the container repairers to push out damaged sections. The new generation air-over-hydraulic Xvari foot pumps enable finer and safer control of tasks while completing jobs up to twice as quickly as conventional pumps. The 700 bar Xvari XA features tremendously high oil flow, with its rotating air motor and rotating two-stage pump element giving hydraulic delivery up to 50% higher than conventional pumps with linear motor and single piston. The pump can be readily coupled with any of the huge range of compact but powerful 700 bar cylinders in the Enerpac range, which use advanced high-pressure technology to deliver excellent performance out of smaller and more easily and safely handled tools. Xvari pumps are fully compatible with the latest RC-Series Duo cylinders, which incorporate Enerpac’s exclusive GR2 bearing system surrounding the cylinder seal for ultimate protection. Its innovative design also distributes lateral loads more effectively, increasing cylinder life. According to Mr Lange, Xvari air-over-hydraulic pumps’ variable oil flow and fine metering for precise control are coupled with ergonomic two-pedal control of advance and retract functions for time-efficient and safer hands-free operation with less operator fatigue and increased stability. While the Australian container company required only a 10-ton capacity to successfully perform its task, the RC Duo family extends over dozens of models in capacities of 5-95 tons with strokes of 16-362mm. 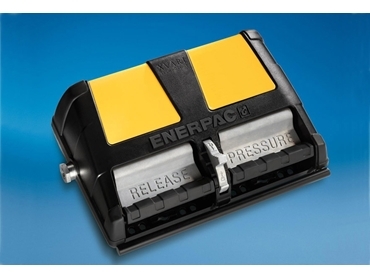 The broader Enerpac range includes individual cylinders in capacities up to 1,000 tons, which are extensively used in demanding industries such as mining and energy, oil and gas, and building and energy to provide safe and reliable service with minimum downtime. Mr Lange believes that this innovation is also broadly applicable to global markets such as the US and Europe as well as Asia and China.